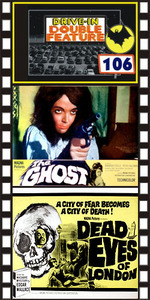 THE GHOST (1963) Barbara Steele, Peter Baldwin. Directed by Riccardo Freda. The chilling sequel to Horrible Dr. Hichcock. Barbara and her lover plan the murder of her husband, Dr. Hichcock, who somehow miraculously survived his fall off the stairwell in the first film. They kill him, but is he really dead? A terrific climax with a wonderful close-up of Steele laughing maniacally. A very underrated Euro-chiller. Technicolor, 35mm. Plus: DEAD EYES OF LONDON (1961) Joachim Fuchsberger, Karen Baal, Klaus Kinski, Andy Berber. In the early 1960's a large number of German films came out based on horror stories of Edgar Wallace. This is one of the best, a remake of Lugosi's The Human Monster. 16mm.